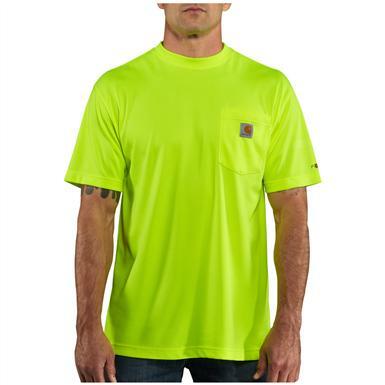 Stay highly comfortable and highly visible with this Carhartt® Force® Color Enhanced High-visibility T-shirt. It's made of lightweight performance fabric that wicks away sweat, repels stand and defeats odors. Plus, it features a relaxed fit and side-seam construction for comfortable freedom of movement. Mens Carhartt Force Color Enhanced High-visibility T-shirt, Short-sleeved is rated 5.0 out of 5 by 3. Rated 5 out of 5 by Shadows from Just what I expected Well made! Fits right. I got the orange one and it is bright. Rated 5 out of 5 by DannyGun Six from Great price! Vivid orange tee! Very comfortable and well made. Excellent fit too. Rated 5 out of 5 by James804 from Great Hi-Visibility Shirt Nice shirt with Carhartt Logo. Great to be visible when bike riding. Unlike cotton which sticks to you when sweating, air passes through, so cool on hot days.